In the mid 1980s, Sorbo travelled around Europe and Australia working in television commercials and worked in over 150 commercials by the early 1990s. One of the popular commercials he appeared in was for Jim Beam bourbon whiskey, known for Sorbo's repeated catchphrase "This ain't Jim Beam". He made his acting debut in 1986 appearing in an episode of the soap opera Santa Barbara. This was followed by guest appearances in television series such as 1st & Ten, Murder She Wrote and The Commish. In 1992, he starred in an unsuccessful pilot for a medical drama series titled Condition: Critical which was not picked up but aired as a television film on CBS. He was considered for and lost out to Dean Cain as Superman in Lois & Clark: The New Adventures of Superman and was a possible contender for the role of Agent Mulder in The X Files which went to David Duchovny. In 1993, he made his film debut playing a supporting role in Slaughter of the Innocents. In 1994, he got his breakthrough leading role as the Ancient Greek mythical demigod Hercules in a series of five television films which aired that year as part of Universal Television's Action Pack. The first film was Hercules and the Amazon Women which aired in April and the fifth film Hercules in the Maze of the Minotaur aired in November. The ratings success of these films paved the way for the commissioning of the television series Hercules: The Legendary Journeys which started airing in syndication from January 1995 and ran for six seasons. The series made Sorbo an international star and was one of the highest rated syndicated television shows at the time. Sorbo also directed two episodes of the series during its run and co-wrote one episode. The success of the show spawned the popular spin-off series Xena: Warrior Princess starring Lucy Lawless, who first appeared as Xena in three Season One episodes of Hercules. Sorbo also guest starred in Xena's Season One episode "Prometheus". In 1998, a spin-off direct-to-video animated film titled Hercules and Xena – The Animated Movie: The Battle for Mount Olympus was released with both Sorbo and Lawless voicing the characters. Hercules was cancelled midway through the filming of Season Six of which only eight episodes were produced and the final episode aired in November 1999. This was reportedly due to Sorbo declining to extend his contract to continue starring in the series for a further three years. Sorbo would go on to make his final appearance as Hercules on Xena in the Season Five episode "God Fearing Child" which aired in February 2000. He served as executive producer and star of the movie Abel's Field in 2012. In 2012, Sorbo appeared in an episode of Celebrity Ghost Stories to recount an experience he had while in Minnesota shortly after he graduated from college. He and his girlfriend claimed to have seen the ghost of the "Bride of White Rock Lake" – a woman who supposedly died on her wedding day, murdered by a former lover. In 2017, Sorbo played the ill-fated King Lar Gand of Daxam on the CW series Supergirl. He appeared opposite Teri Hatcher as his wife Queen Rhea—24 years earlier, they were almost cast opposite each other in Lois and Clark before Sorbo lost out to Dean Cain. Cain also appeared in the same series but did not share any scenes with them. That same year, he also directed and starred in the film Let There Be Light. Kevin Sorbo's career also includes voice over work (or voice acting) with Breathe Bible. 2012 The Eric André Show Himself "The Eric André New Year's Eve Spooktacular"
^ "Kevin Sorbo Biography & Filmography". CultCelebrities.com. Retrieved January 9, 2019. ^ a b "Kevin Sorbo Biography (1958–)". Filmreference.com. Retrieved October 18, 2012. ^ "Once a kid... always a kid". KSJAA - Kevin Sorbo bio 1958-77. Russia: narod.ru. ^ Mendoza, N.F. (November 6, 1994). "With an Eye On: Kevin Sorbo's Hercules is strong stuff but not exactly his serious side". Los Angeles Times. Retrieved May 6, 2016. ^ "Filed Away (Features)". The Mirror. London, England. September 29, 1997. Archived from the original on September 24, 2018. Retrieved September 24, 2018. Hercules hunk Kevin Sorbo has revealed that he nearly played Fox Mulder in The X Files. The 6ft 3in muscleman was beaten to the role by 5ft 7in David Duchovny after the two auditioned for creator Chris Carter. ^ Yamato, Jen (September 28, 2011). "Fantastic Fest: Kevin Sorbo on the Twisted Julia X 3D, Christian Films, and Hollywood Snobbery". Movieline. Retrieved September 24, 2018. You were previously up to play roles like Superman and Mulder in The X-Files before your Hercules days. ^ Garcia, Frank; Phillips, Mark (2013). Science Fiction Television Series, 1990–2004: Histories, Casts and Credits for 58 Shows. McFarland. p. 370. Retrieved September 24, 2018 – via Google Books. ^ Abbie (March 21, 2016). "Kevin Sorbo – Interview". The Junction. WordPress. Retrieved September 24, 2018. ^ "Winston-Salem Journal". August 29, 1997. Retrieved September 24, 2018. People make too big a deal out of me getting the Agent Mulder role in that, he said with a laugh. I got in to read twice for that part. Nowhere near getting it. How would he be different if I played him? Mulder would be taller. ^ "Australia TV Week". Australia. July 7, 1997. Retrieved September 24, 2018. Before Hercules, you were up for David Duchovny's role in 'The X-Files'. What would you have brought to Fox Mulder that Duchovny hasn't? ^ "Calgary Sun". Canada. August 24, 1997. Retrieved September 24, 2018. I was one of many who were being considered for Fox Mulder, so that wasn't such a disappointment. ^ MENDOZA, N. F. (November 6, 1994). "WITH AN EYE ON . . . : Kevin Sorbo's Hercules is strong stuff but not exactly his serious side" – via LA Times. ^ a b "Kevin Sorbo", The sci-fi world (interview) . ^ "Biography" (official website). 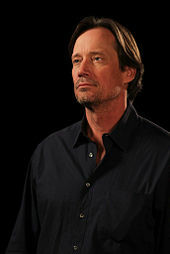 Kevin Sorbo. Archived from the original on October 13, 2015. Retrieved October 2, 2015. ^ "Entertainment", The Los Angeles times, 1999-11-27 . ^ "Kull the Conqueror (1997)". New York Times. Retrieved October 2, 2015. ^ "Weekend Box Office Chart for January 25th, 2008". The Numbers. January 25, 2008. Retrieved October 18, 2012. ^ "Meet the Spartans". Rotten Tomatoes. Retrieved October 18, 2012. ^ Woman, The (March 26, 2010). "Pre-Order Tales of an Ancient Empire; Work-in-Progress Screengrab & Behind-the-Scenes Clip | Horror Movie, DVD, & Book Reviews, News, Interviews at Dread Central". Dreadcentral.com. Retrieved October 18, 2012. ^ "Abel's Field with Kevin Sorbo and Samuel Davis an Inspiring Movie – Christian Activities". christianactivities.com. Retrieved February 21, 2013. ^ "Celebrity Ghost Stories - Kevin Sorbo - Ghostly Bride". Bio.com. Youtube. Retrieved October 2, 2015. ^ "The Conduit Gets Hollywood Voice Talent". cinema blend. Retrieved October 2, 2015. ^ "God of War III Kevin Sorbo voice of Hercules". youtube.com. Retrieved October 2, 2015. ^ Conditt, Jessica (October 3, 2012). "Kevin Sorbo, Sam Sorbo, Martin Olson star in Cloudberry Kingdom". Joystiq. Retrieved October 16, 2013. ^ "'God's Not Dead' Actor Says Hollywood Is 'Waking Up' to Christian Films". christianpost.com. Retrieved October 2, 2015. ^ "Kevin Sorbo Talks About His Role on "Supergirl"". February 8, 2017. ^ "Hercules Actor Kevin Sorbo's Miracle Healing – CBN TV – Video". Cbn.com. Retrieved October 18, 2012. ^ Gostin, Nicki (October 19, 2011). "Kevin Sorbo's 'True Strength': 'Hercules' Star Says Strokes Were Blessings In Disguise". Huffington Post. Retrieved April 14, 2013. ^ Hammel, Sara (October 2, 2011). "Hercules Star Kevin Sorbo Reveals He's Had Several Strokes". People.com. Retrieved October 18, 2012. ^ Symons, Jane (February 28, 2012). "Kevin Sorbo: Three strokes left me fighting for my life". Daily Express. Retrieved April 14, 2013. ^ Sorbo, Kevin (October 11, 2011). "True Strength: My Journey from Hercules to Mere Mortal--and How Nearly Dying Saved My Life". Boston, Massachusetts: Da Capo Press. Retrieved August 3, 2013. ^ "Sam Sorbo talks hubby Kevin Sorbo & True Strength: He truly is my hero". sorbowriter.wordpress.com. Retrieved October 2, 2015. ^ Graham, Efrem (August 27, 2015). "Kevin Sorbo Uses Faith to Make 'World Fit for Kids'". cbn.com. Retrieved October 2, 2015. ^ Vivaldo, Josephine (March 8, 2011). "Kevin Sorbo – Christian Hercules in Hollywood". Christian Post. Retrieved March 2, 2018. ^ Savitsky, Sasha (March 20, 2014). "Kevin Sorbo: Why is Hollywood so afraid of God?". Fox News. Retrieved June 2, 2014. ^ Hallowell, Billy (February 6, 2013). "Hercules' Actor Kevin Sorbo Bashes Hollywood's Liberal Hypocrisy and Rips Obama: 'One of the Worst Records' in American History". TheBlaze.com. Retrieved November 4, 2013. ^ "Kevin Sorbo On Why He Thinks Jesus Would Vote For Donald Trump". Fox News Insider. August 27, 2016. Retrieved March 2, 2018. ^ Abel's Field (DVD). 2012. Event occurs at Closing credits. ^ Rolfe, Donna. "Abel's Field – Review". Dove Family Foundation. Retrieved 2015-04-20. ^ "Local OHS Grad Produces Hollywood Feature Film". Brian Harrington. Retrieved 2017-03-10. ^ ""Key and Peele" Episode #2.6 (TV Episode 2012)". Retrieved February 3, 2017.